There’s a reason that so many business terms come from the language of sports and recreation. We can learn a lot from playing well with others, knowing when to take the lead, and thinking a few steps ahead. Whether you’re a fierce competitor or a weekend warrior, there are plenty of ways to stay healthy, make friends and gain teammates, and have a great time playing intramurals or participating in activities. 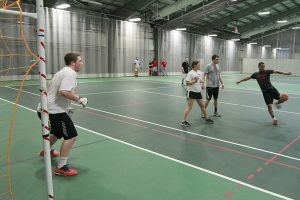 Intramurals are free and open to all students throughout the year.